It is no secret that the Japanese are known for their commitment to a healthy lifestyle and a particular focus on natural and traditional foods as well as cosmetic products. A great many attempts have been made to uncover the mystery behind the beauty of Japanese women and their secret of youth. 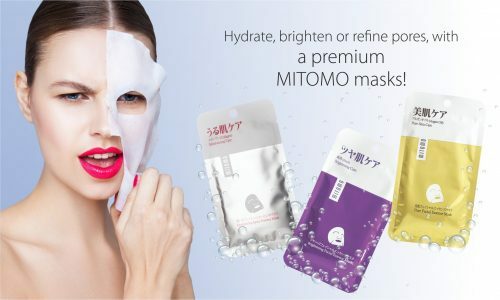 The most popular product of the Mitomo range is the facial sheet mask that stand out for their unique ingredients. Most popular facial sheet masks. Gold and Bee Venom, Platinum and Placenta , Snail Extract and EGF , Collagen and Lithospermum , Hyaluronan and Lithospermum , Q10 and Lithospermum. Gold promotes the production of collagen and elastin, making the skin more radiant. Bee venom has been widely used in traditional medicine as it stimulates the production of collagen and elastin, moisturises and firms the skin. Mask with Argan Oil, Mask with Coal (for pore control), Mask with Collagen(moisturizing effect) , Mask with Pearl(brightening effect). New range of facial sheets masks made from natural ingredients. Camellia Essence Masks, Green Tea Essence Masks, Rice Leaven Essence Masks, Sake Essence Masks, Soy Bean Essence Masks, Tea Tree Essence Masks. Sake has various organic acids, vitamin and esters. Sake has far more moisturizing elements such as glycerol, or gricerine, and amino acids than other alcoholic beverages. Those elements are often used in cosmetics. Sake Bath (adding a bit of Sake to bath) has better moisturizing and heat-retention effects than bath without Sake (with and without bath powder).